Mankind versus machine: it’s the ultimate contest. Think of Bowman and Poole doing battle with HAL, Sarah Connor taking on the Terminator, ED209 running riot or even Austin Powers wrestling with the Fembots – the fear of being outsmarted by our robot creations has long been fertile ground for sci-fi storytelling. And it’s not just fiction that’s to blame for putting such thoughts in our collective consciousness. Chess Grandmaster Gary Kasparov’s historic loss to IBM supercomputer Deep Blue, Watson’s triumph on the TV show Jeopardy, plus recent victories for artificial intelligence at everything from Atari games to professional poker to Go, have only compounded our growing sense of unease at the rise of the machines. The worry is that now they’ve kicked our butts at our favourite games, they’ll turn to taking our livelihoods, too. Bloody robots, coming here and stealing our jobs. After all, over the past few years, developments in artificial intelligence have made it possible to automate almost all routine, repetitive and predictable work. And despite its name, AI is very real: bots will power 85% of customer service interactions by 2020, with the wider AI and robotics market predicted to be a $153 billion industry by that point. For some, the automation of white-collar work is already here: January saw Japanese firm Fukoku Mutual Life Insurance announce it was making 34 employees redundant and replacing them with IBM’s Watson Explorer AI. Lingerie retailer Cosabella recently ditched its digital agency in favour of an AI platform, tripling its ROI and increasing its customer base by 30% in the process. And the Associated Press sports department is now using automation to generate reports for events with small audiences, freeing up staff to do more important things and helping stretch media budgets. Examples of AI proving more adept than humans at a whole range of tasks abound. And here’s where the fear lies for the majority of folks. Last year, the Bank of England’s chief economist predicted that up to 80 million US and 15 million UK jobs might be performed by robots. 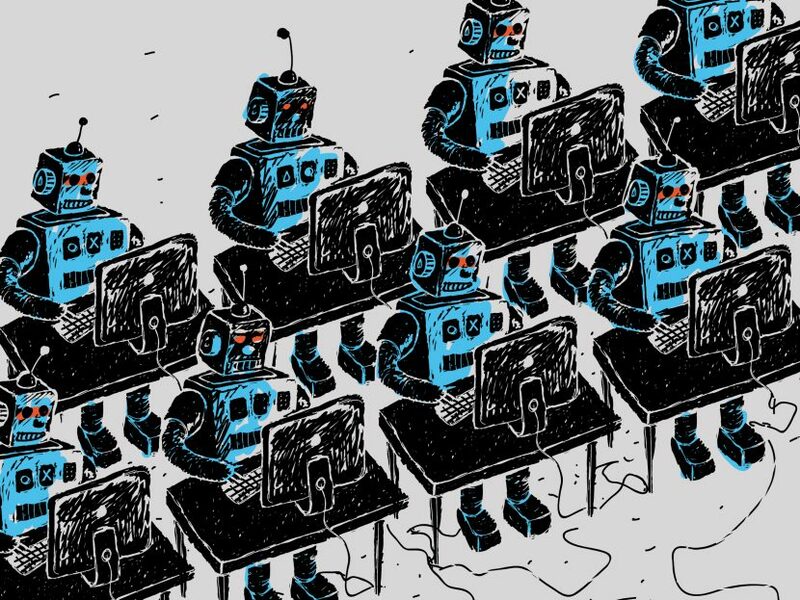 And it’s not just those on the factory floor: if you’re a telemarketer, paralegal or financial advisor you might want to start retraining now, with all three jobs facing a greater than 94% chance of automation, according to Oxford University research. But is this a legitimate concern? Are our jobs truly in danger? Of course, some jobs are more at risk than others. Those that are highly repetitive, process-driven or involve high-levels of predictability are more likely to be automated than those that involve high-touch human relationships or creativity. And even then, the jobs themselves won’t entirely vanish; rather, they will be redefined. Displacement, not replacement. For instance, Amazon’s widespread adoption of robotics technology in its fulfilment centres has helped the ecommerce giant drive down shipping costs and pass those savings on to customers. But in order to meet the increased demand those low shipping charges has produced, the company needs to hire more staff: a recent announcement unveiled plans to create 100,000 more US jobs over the next 18 months, with a further 5000 planned for the UK. In addition, he sees a growing need for service designers: people who know how to see through the eyes of the customer, and design services and experiences relevant to them. Occupations that involve building complex relationships with people – such as nurses, therapists and care workers, for example, or a business role that requires you to build close relationships with clients – will also remain in demand. Indeed, it is estimated that by 2025, 65% of today’s students will be doing jobs that don’t even exist yet due to technological change, economic turbulence and societal transformation.